For the medical specialty covering all imaging modes, see Radiology. For treatment using radiation, see Radiotherapy. Projectional radiography of the knee in a modern X-ray machine. Since the body is made up of various substances with differing densities, X-rays can be used to reveal the internal structure of the body on film by highlighting these differences using attenuation, or the absorption of X-ray photons by the denser substances (like calcium-rich bones). The discipline involving the study of anatomy through the use of radiographic films is known as radiographic anatomy. Medical radiography acquisition is generally carried out by radiographers, while image analysis is generally done by radiologists. Medical radiography includes a range of modalities producing many different types of image, each of which has a different clinical application. The creation of images by exposing an object to X-rays or other high-energy forms of electromagnetic radiation and capturing the resulting remnant beam (or "shadow") as a latent image is known as "projection radiography." The "shadow" may be converted to light using a fluorescent screen, which is then captured on photographic film, it may be captured by a phosphor screen to be "read" later by a laser (CR), or it may directly activate a matrix of solid-state detectors (DR—similar to a very large version of a CCD in a digital camera). Bone and some organs (such as lungs) especially lend themselves to projection radiography. It is a relatively low-cost investigation with a high diagnostic yield. The difference between soft and hard body parts stems mostly from the fact that carbon has a very low X-ray cross section compared to calcium. 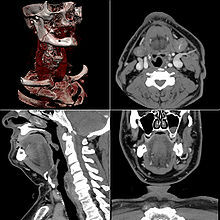 Computed tomography or CT scan (previously known as CAT scan, the "A" standing for "axial") uses ionizing radiation (x-ray radiation) in conjunction with a computer to create images of both soft and hard tissues. These images look as though the patient was sliced like bread (thus, "tomography"-- "tomo" means "slice"). Though CT uses a higher amount of ionizing x-radiation than diagnostic x-rays (both utilising X-ray radiation), with advances in technology, levels of CT radiation dose and scan times have reduced. CT exams are generally short, most lasting only as long as a breath-hold, Contrast agents are also often used, depending on the tissues needing to be seen. Radiographers perform these examinations, sometimes in conjunction with a radiologist (for instance, when a radiologist performs a CT-guided biopsy). DEXA, or bone densitometry, is used primarily for osteoporosis tests. It is not projection radiography, as the X-rays are emitted in 2 narrow beams that are scanned across the patient, 90 degrees from each other. Usually the hip (head of the femur), lower back (lumbar spine), or heel (calcaneum) are imaged, and the bone density (amount of calcium) is determined and given a number (a T-score). It is not used for bone imaging, as the image quality is not good enough to make an accurate diagnostic image for fractures, inflammation, etc. It can also be used to measure total body fat, though this is not common. The radiation dose received from DEXA scans is very low, much lower than projection radiography examinations. Fluoroscopy is a term invented by Thomas Edison during his early X-ray studies. The name refers to the fluorescence he saw while looking at a glowing plate bombarded with X-rays. The technique provides moving projection radiographs. Fluoroscopy is mainly performed to view movement (of tissue or a contrast agent), or to guide a medical intervention, such as angioplasty, pacemaker insertion, or joint repair/replacement. The latter can often be carried out in the operating theatre, using a portable fluoroscopy machine called a C-arm. It can move around the surgery table and make digital images for the surgeon. Biplanar Fluoroscopy works the same as single plane fluoroscopy except displaying two planes at the same time. The ability to work in two planes is important for orthopedic and spinal surgery and can reduce operating times by eliminating re-positioning. Angiography is the use of fluoroscopy to view the cardiovascular system. An iodine-based contrast is injected into the bloodstream and watched as it travels around. Since liquid blood and the vessels are not very dense, a contrast with high density (like the large iodine atoms) is used to view the vessels under X-ray. Angiography is used to find aneurysms, leaks, blockages (thromboses), new vessel growth, and placement of catheters and stents. Balloon angioplasty is often done with angiography. Contrast radiography uses a radiocontrast agent, a type of contrast medium, to make the structures of interest stand out visually from their background. Contrast agents are required in conventional angiography, and can be used in both projectional radiography and computed tomography (called "contrast CT"). Although not technically radiographic techniques due to not using X-rays, imaging modalities such as PET and MRI are sometimes grouped in radiography because the radiology department of hospitals handle all forms of imaging. Treatment using radiation is known as radiotherapy. Industrial radiography is a method of non-destructive testing where many types of manufactured components can be examined to verify the internal structure and integrity of the specimen. Industrial Radiography can be performed utilizing either X-rays or gamma rays. Both are forms of electromagnetic radiation. The difference between various forms of electromagnetic energy is related to the wavelength. X and gamma rays have the shortest wavelength and this property leads to the ability to penetrate, travel through, and exit various materials such as carbon steel and other metals. Specific methods include industrial computed tomography. Sharpness of a radiographic image is strongly determined by the size of the X-ray source. This is determined by the area of the electron beam hitting the anode. A large photon source results in more blurring in the final image and is worsened by an increase in image formation distance. This blurring can be measured as a contribution to the modulation transfer function of the imaging system. The dosage of radiation applied in radiography varies by procedure. For example, the effective dosage of a chest x-ray is 0.1 mSv, while an abdominal CT is 10 mSv. The American Association of Physicists in Medicine (AAPM) have stated that the "risks of medical imaging at patient doses below 50 mSv for single procedures or 100 mSv for multiple procedures over short time periods are too low to be detectable and may be nonexistent." Other scientific bodies sharing this conclusion include the International Organization of Medical Physicists, the UN Scientific Committee on the Effects of Atomic Radiation, and the International Commission on Radiological Protection. Nonetheless, radiological organizations, including the Radiological Society of North America (RSNA) and the American College of Radiology (ACR), as well as multiple government agencies, indicate safety standards to ensure that radiation dosage is as low as possible. In response to increased concern by the public over radiation doses and the ongoing progress of best practices, The Alliance for Radiation Safety in Pediatric Imaging was formed within the Society for Pediatric Radiology. In concert with the American Society of Radiologic Technologists, the American College of Radiology, and the American Association of Physicists in Medicine, the Society for Pediatric Radiology developed and launched the Image Gently campaign which is designed to maintain high quality imaging studies while using the lowest doses and best radiation safety practices available on pediatric patients. This initiative has been endorsed and applied by a growing list of various professional medical organizations around the world and has received support and assistance from companies that manufacture equipment used in radiology. Following upon the success of the Image Gently campaign, the American College of Radiology, the Radiological Society of North America, the American Association of Physicists in Medicine, and the American Society of Radiologic Technologists have launched a similar campaign to address this issue in the adult population called Image Wisely. The World Health Organization and International Atomic Energy Agency (IAEA) of the United Nations have also been working in this area and have ongoing projects designed to broaden best practices and lower patient radiation dose. A plain radiograph of the elbow. AP radiograph of the lumbar spine. In medicine, projectional radiographs and computed tomography images generally use X-rays created by X-ray generators, which generate X-rays from X-ray tubes. A number of other sources of X-ray photons are possible, and may be used in industrial radiography or research; these include betatrons, and linear accelerators (linacs) and synchrotrons. For gamma rays, radioactive sources such as 192Ir, 60Co or 137Cs are used. As an alternative to X-ray detectors, image intensifiers are analog devices that readily convert the acquired X-ray image into one visible on a video screen. This device is made of a vacuum tube with a wide input surface coated on the inside with caesium iodide (CsI). When hit by X-rays material phosphors which causes the photocathode adjacent to it to emit electrons. These electron are then focus using electron lenses inside the intensifier to an output screen coated with phosphorescent materials. The image from the output can then be recorded via a camera and displayed. Digital devices known as array detectors are becoming more common in fluoroscopy. These devices are made of discrete pixelated detectors known as thin-film transistors (TFT) which can either work indirectly by using photo detectors that detect light emitted from a scintillator material such as CsI, or directly by capturing the electrons produced when the X-rays hit the detector. Direct detector do not tend to experience the blurring or spreading effect caused by phosphorescent scintillators of or film screens since the detectors are activated directly by X-ray photons. Dual-energy radiography is where images are acquired using two separate tube voltages. This is the standard method for bone densitometry. It is also used in CT pulmonary angiography to decrease the required dose of iodinated contrast. Taking an X-ray image with early Crookes tube apparatus, late 1800s. Radiography's origins and fluoroscopy's origins can both be traced to 8 November 1895, when German physics professor Wilhelm Conrad Röntgen discovered the X-ray and noted that, while it could pass through human tissue, it could not pass through bone or metal. Röntgen referred to the radiation as "X", to indicate that it was an unknown type of radiation. He received the first Nobel Prize in Physics for his discovery. There are conflicting accounts of his discovery because Röntgen had his lab notes burned after his death, but this is a likely reconstruction by his biographers:  Röntgen was investigating cathode rays using a fluorescent screen painted with barium platinocyanide and a Crookes tube which he had wrapped in black cardboard to shield its fluorescent glow. He noticed a faint green glow from the screen, about 1 metre away. Röntgen realized some invisible rays coming from the tube were passing through the cardboard to make the screen glow: they were passing through an opaque object to affect the film behind it. ^ Jang, J; Jung, SE; Jeong, WK; Lim, YS; Choi, JI; Park, MY; Kim, Y; Lee, SK; Chung, JJ; Eo, H; Yong, HS; Hwang, SS (February 2016). "Radiation Doses of Various CT Protocols: a Multicenter Longitudinal Observation Study". Journal of Korean Medical Science. 31 Suppl 1: S24–31. doi:10.3346/jkms.2016.31.S1.S24. PMC 4756338. PMID 26908984. ^ Carroll, Quinn B (2014). Radiography in the Digital Age (2nd ed.). Springfield: Charles C Thomas. p. 9. ISBN 9780398080976. ^ Seeram, Euclid; Brennan, Patrick C. (2016). Radiation Protection in Diagnostic X-Ray Imaging. Jones & Bartlett. ISBN 9781284117714. ^ Schueler, Beth A. (July 2000). "The AAPM/RSNA Physics Tutorial for Residents General Overview of Fluoroscopic Imaging". RadioGraphics. 20 (4): 1115–1126. doi:10.1148/radiographics.20.4.g00jl301115. PMID 10903700. ^ Quader, Mohammed A; Sawmiller, Carol J; Sumpio, Bauer E (2000). "Radio Contrast Agents: History and Evolution". Textbook of Angiology. pp. 775–783. doi:10.1007/978-1-4612-1190-7_63. ISBN 978-1-4612-7039-3. ^ Brant, William E.; Helms, Clyde A. (2007). "Diagnostic Imaging Methods". Fundamentals of Diagnostic Radiology (3rd ed.). Philadelphia: Lippincott Williams & Wilkins. p. 3. ISBN 9780781761352. ^ "Reducing Radiation from Medical X-rays". FDA.gov. Retrieved 9 September 2018. ^ Goldberg, Jeanne (September – October 2018). "From the Spectral to the Spectrum". Skeptical Inquirer. 42 (5). ^ Alchemy Art Lead Products – Lead Shielding Sheet Lead For Shielding Applications. Retrieved 2008-12-07. ^ "IG new: The Alliance | image gently". Pedrad.org. Archived from the original on 9 June 2013. Retrieved 16 August 2013. ^ "Radiation Safety in Adult Medical Imaging". Image Wisely. Retrieved 16 August 2013. ^ "Optimal levels of radiation for patients - Pan American Health Organization - Organización Panamericana de la Salud". New.paho.org. 24 August 2010. Archived from the original on 25 May 2013. Retrieved 16 August 2013. ^ "Radiation Protection of Patients". Rpop.iaea.org. 14 March 2013. Retrieved 16 August 2013. ^ "World Health Organisation: Global Initiative on Radiation Safety in Healthcare Settings: Technical Meeting Report" (PDF). Who.int. Retrieved 16 August 2013. ^ Chalkley, M.; Listl, S. (2018). "First do no harm – The impact of financial incentives on dental X-rays". Journal of Health Economics. 58 (March 2018): 1–9. doi:10.1016/j.jhealeco.2017.12.005. PMID 29408150. ^ Bushberg, Jerrold T (2002). The essential physics of medical imaging (2nd ed.). Philadelphia: Lippincott Williams & Wilkins. p. 210. ISBN 9780683301182. ^ Ranger, NT (1999). "Radiation detectors in nuclear medicine". Radiographics. 19 (2): 481–502. doi:10.1148/radiographics.19.2.g99mr30481. PMID 10194791. ^ DeWerd, LA; Wagner, LK (January 1999). "Characteristics of radiation detectors for diagnostic radiology". Applied Radiation and Isotopes. 50 (1): 125–36. doi:10.1016/S0969-8043(98)00044-X. PMID 10028632. ^ Anwar, Kamal (2013). "Nuclear Radiation Detectors". Particle Physics. Graduate Texts in Physics. Berlin: Springer-Verlag. pp. 1–78. doi:10.1007/978-3-642-38661-9_1. ISBN 978-3-642-38660-2. ^ Hendee, William R.; Ritenour, E. Russell (2002). "Fluoroscopy". Medical Imaging Physics (4th ed.). Hoboken, NJ: John Wiley & Sons. ISBN 9780471461135. ^ Seibert, J. Anthony (22 July 2006). "Flat-panel detectors: how much better are they?". Pediatric Radiology. 36 (S2): 173–181. doi:10.1007/s00247-006-0208-0. PMC 2663651. PMID 16862412. ^ Cochrane Miller, Janet (2015). "Dual Energy CT Imaging for Suspected Pulmonary Embolism Using a Lower Dose of Contrast Agent". Radiology Rounds. 13 (7). ^ "History of Radiography". NDT Resource Center. Iowa State University. Retrieved 27 April 2013. ^ "5 unbelievable things about X-rays you can't miss". vix.com. Retrieved 23 October 2017. ^ a b Markel, Howard (20 December 2012). "'I Have Seen My Death': How the World Discovered the X-Ray". PBS NewsHour. PBS. Retrieved 27 April 2013. ^ Meggitt, Geoff (2008). Taming the Rays: a history of radiation and protection. lulu.com. p. 3. ISBN 978-1409246671. ^ "Major John Hall-Edwards". Birmingham City Council. Archived from the original on 28 September 2012. Retrieved 2012-05-17. ^ Spiegel, Peter K. (1995). "The first clinical X-ray made in America—100 years" (PDF). American Journal of Roentgenology. Leesburg, VA: American Roentgen Ray Society. 164 (1): 241–243. doi:10.2214/ajr.164.1.7998549. ISSN 1546-3141. PMID 7998549. Archived from the original (PDF) on 8 April 2008. Wikimedia Commons has media related to X-rays. Radiation Safety in Industrial Radiography, Specific Safety Guide No. SSG-11, International Atomic Energy Agency, Vienna, 2011. Shroy, Jr., Robert E. (1995). "X-Ray equipment". In Bronzino, J.D. (ed.). The Biomedical Engineering handbook. CRC Press and IEEE Press. pp. 953–960. ISBN 978-0-8493-8346-5. Herman, Gabor T. (2009). Fundamentals of Computerized Tomography: Image Reconstruction from Projections (2nd ed.). Springer. ISBN 978-1-85233-617-2. Yu, Shi-Bao; Alan D. Watson (1999). "A review on the subject of medical X-ray examinations and metal based contrast agents". Chemical Reviews. 99 (9): 2353–2378. doi:10.1021/cr980441p. PMID 11749484.